North America Sheet IV Lake Superior. A beautiful 1832 S.D.U.K. map of Lake Superior, the largest of the five Great Lakes. 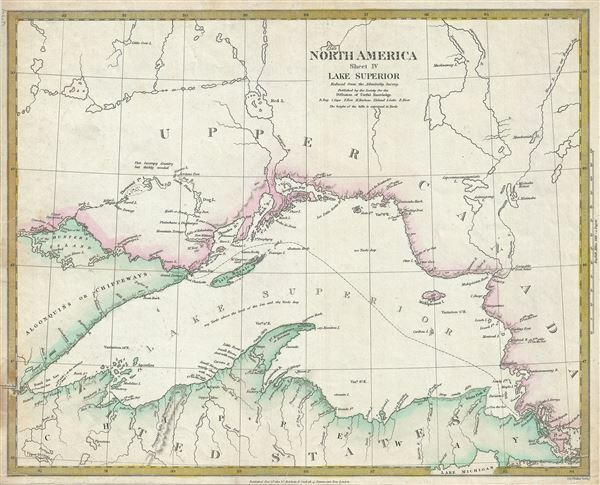 Centered on Lake Superior, the map coves the modern day regions of southern Ontario, northern Michigan and northeastern Minnesota. Although the interiors remain poorly mapped, several rivers, islands and lakes are noted throughout. The Indian tribe of Alogonquins or Chippeways is also identified. Also notes the American Fur Company, one of the largest businesses in the early 19th century. Published in 1832 by Baldwin and Cradock of Paternoster Row for the Society for the Diffusion of Useful Knowledge, or S.D.U.K. Although the Society formally closed its doors in 1848, subsequent reissues of the S.D.U.K. atlas were printed well into the 1870s by Chapman and Hall, who acquired the original plates. Maps of the Society for the Diffusion of Useful Knowledge, (London: Baldwin & Cradock), 1832. Very good. Minor edge wear. Backed with archival tissue for stabilization. Rumsey 0890.131. Phillips (Atlases) 794.